This section of the LUGOD site contains copies of presentation slides and handouts created by people who have spoken at our meetings, as well as slides and handouts from Linux-related talks that LUGOD members have made during presentations at other events. Bill Kendrick, CTO, Smashwords, Inc.
Dan Reverri, Basho Technologies, Inc.
Todd Trichler, Oracle Technology Network. Douglas Barbieri, Made to Order Software. A discussion of distributed computing using Linux clusters. Streaming video on the Internet using Linux. Various file systems available for UNIX and Linux. Keeping track of changes in source code and other kinds of documents using a revision control system. The SourceForge.net Open Source software development site and software repository. Linux-based thin client systems designed for K-12 schools. Using CSS to design the visual style of a website. A KDE-based tool for designing and executing graphical dialogs. A distributed filesystem from Oracle. Steve Caruso, Senior High Performance Computing Engineer, Silicon Graphics, Inc. The new KDE 3.2 Linux desktop and applications. Controlling incoming and outbound network traffic. Using 'autotools' to maintain build scripts in a development environment. Capturing and editing divital video, and authoring video DVDs under Linux. An overview of Linux and Open Source for average computer users. An overview of Open Source suitable for Libraries. An overview of educational and gaming software for children that's available for Linux. A low-cost Linux-based handheld computer designed for the developing world. An overview of the 64-bit "AMD64" architecture. Hardware and software hacks for the Linux-based TiVo video recorder. An overview of game design and short SDL library tutorial. The BlueCat Linux platform for embedded systems. Programming NVidia's graphics card shaders. An overview of The Gimp graphics and photo manipulation tool. The Linux-based Zaurus handheld computer. A Linux-powered telephone that uses voice over IP (VoIP). A discussion of IBM's involvement with, and use of, Linux and Open Source. An overview of the KDE desktop environment for Linux. How the Open Source Mozilla web browser's development process works, and how to get involved. The basics of wireless networking, and using it under Linux. A discussion of the Digital Millenium Copyright Act. The Linux environment created by Sony for homebrew development on their PlayStation 2 home video game console. A discussion of Linux and a variety of Open Source software suitable for home and small business users. Developing graphical user interfaces for GTK+ applications using the Glade graphical design tool. Running Windows applications on Linux using the CrossOver products. Integrating Linux in a network alongside Windows, Mac and other platforms. The PHP web scripting language. An over view of Linux and Open Source software for small offices. Flight and 'glass cockpit' simulation software under Linux. Searching radio telescope data for extraterrestrial intelligence by distributedly utilizing unused CPU power on home users' computers. The Artificial Linguistic Internet Chat Entity, an Open Source artificial intelligence project. Chuck Groom, Devin Carraway, Blue Mug, Inc.
An advanced discussion of The Gimp graphics and photo manipulation tool. Creating functions in C which can accept a variable number of arguments (e.g., printf() and scanf()). An introduction to the Blender 3D graphics design environment. Developing graphical applications in C++ using the FLTK library. The Linux-based Agenda handheld computer. 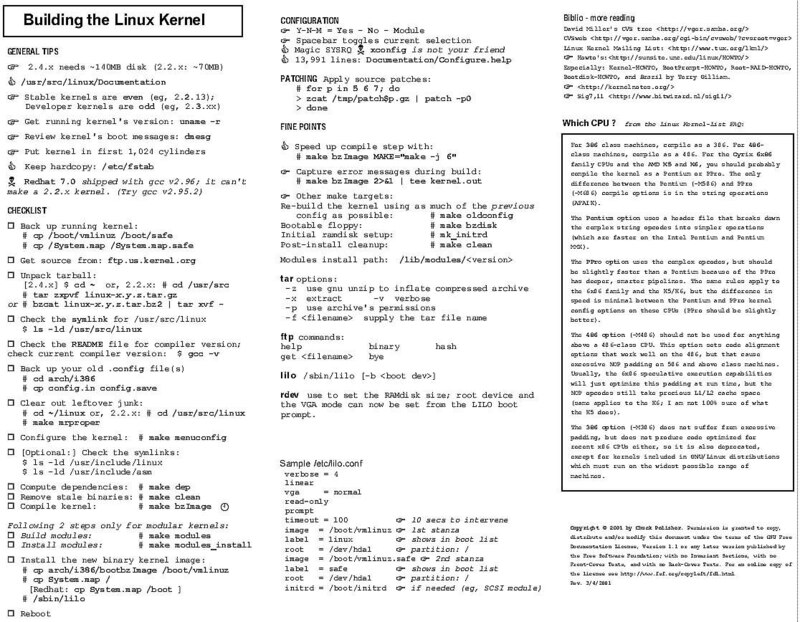 An overview of configuring and compiling the Linux kernel from source. Using a portable implementation of MPI (message passing interface) to create applications that run in parellel on multiple CPUs or in a cluster. Using a modem and a Linux computer as a telephone answering machine or voicemail system. Creating Common Gateway Interface applications for websites using C and the cgi-util library. Developing graphical applications in C using the GTK+ library. Securely connecting to remote computers using SSH, applying the "International Kernel Patch" to add strong cryptography to the Linux kernel, and encrypting data on a hard disk using StegFS. Encrypting and digitally signing e-mail and files using Pretty Good Privacy. Running Linux on PowerPC hardware, such as Apple Macs. An overview of using and programming the Bourne Again Shell (BASH) for Unix.